Give yourself a helping hand to stand up tall against back pain with these posture braces and correctors. Being told to stand or sit up straight was pretty annoying when you were a kid right? I mean it was far more comfortable to slouch ​than to put all that effort into sitting and standing properly. But as annoying as it was, it turns out the adults may have been onto something. Because maintaining a good posture as you sit, stand and move around is a great help when it comes to living a life free from back pain. However old habits can be hard to break. And when you're trying to improve your posture it can feel uncomfortable at first and be very hard to maintain. As it's all too easy to revert to what we know and forget​ to sit or stand up straight. So give yourself a helping hand by using a posture aid. These aids come in various different forms such as shoulder braces, back braces, tank tops, shirts, seat cushions and even technological gadgets. 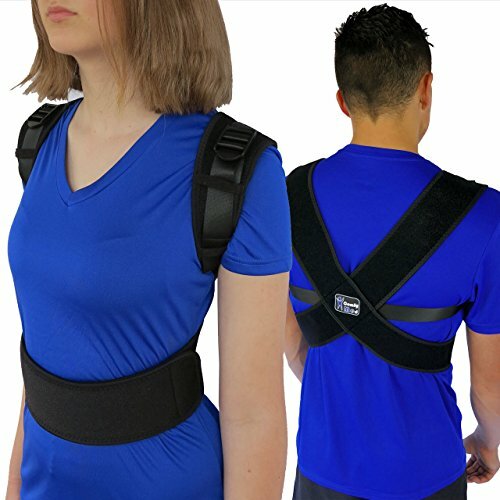 Best posture braces for wearing: ComfyMed Posture Corrector, Flexguard Back Brace Posture Corrector, and the AlignMed Posture Shirt. 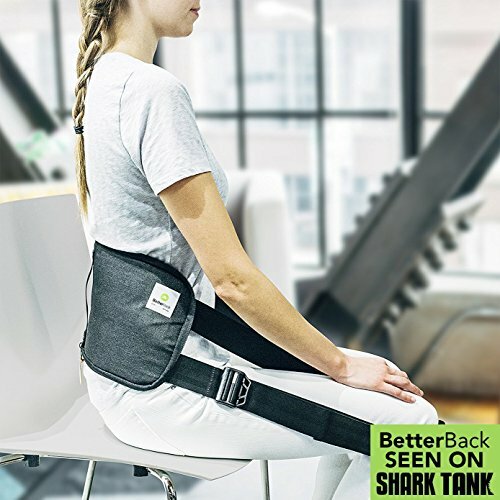 Best posture correctors while sitting: BetterBack Posture Corrector, BackJoy SitSmart Posture Plus and the LoveHome Memory Foam Lumbar Support Cushion. Best electronic posture correctors: Lumo Lift Posture Coach and Upright Pro Posture Trainer. But first let me explain why maintaining a good posture is important. Why Is Poor Posture So Damaging For Your Back? You may not realise it but your body is undergoing a constant battle. And that battle is against gravity. Because the force of gravity is putting pressure on your joints, muscles and ligaments every second of every day. Because when you stand, sit or move around with a bad posture your muscles, bones and joints have to work much harder to keep you upright. And this will cause certain parts of your body to come under too much strain leaving you feeling tight, sore and in pain. As your back typically has to take on most of this extra burden which can lead to muscle, nerve and disc problems if the problem isn't fixed. So learning and maintaining a good posture is vital to ensure this force and pressure is distributed evenly throughout your body. Also when your body isn't balanced correctly muscle knots can form. So you really need to learn how to maintain a healthy posture to stop back pain from rearing it's ugly head. ​This was shown in a study of 124 nurses with chronic lower back pain carried out in 2012. Over a 6-week period they were taught how to adopt a good body posture and make their work ergonomics more spine friendly. The nurses who successfully managed to improve their posture after the 6-weeks were found to have less back pain. So retraining your body to adopt a good posture can make a big difference to your back in both the short and long-term. It's not just your back that benefits from retraining your body to maintain a good posture. It keeps your body balanced and aligned meaning it can work more efficiently and use less energy which helps to prevent muscle fatigue. Improves your breathing which means you can take in more oxygen helping your body to heal and relax. This increase of oxygen also improves your mental abilities such as memory and concentration levels. It improves your circulation and helps with digestion. Helps your internal organs to function properly. Lowers the wear and tear effects on your joints. Also lowers the risk of injury while working and exercising. Improves your mood making you feel happier and more confident. Makes you look more confident and attractive too. Which are all good reasons to work on your posture and makes investing in a decent brace or corrector a wise purchase. Braces that you wear over your shoulders. Shoulder braces that also include a lumbar belt. 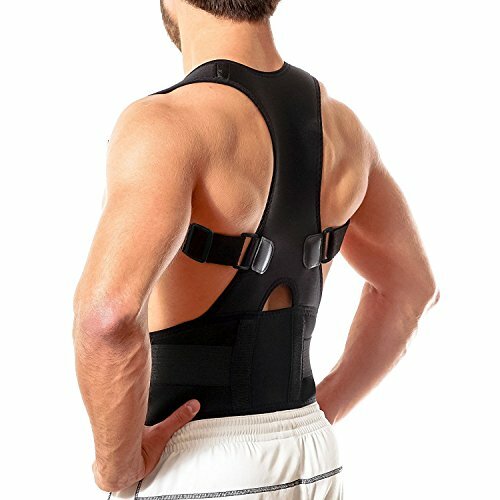 Shirts or tops that have posture braces built into them. All of these offer slightly different benefits but they share the same common goal. Which is placing your body and muscles into a position that encourages good posture and making it easy to maintain that posture. This can feel uncomfortable at first as you will be in a posture that your body isn't used to. But over time you can retrain your muscle memory and this make adopting the right posture a more natural task when you are not​ wearing the braces. And they are also great at making you more aware of how you are sitting and standing so you'll be less likely to slip back into bad habits. Just be aware not to overuse them as you don't want to become dependent on them and weaken your postural muscles. And as well as wearing a brace you'll also get better results if you get into the habit of keeping your core muscles strong and stretching regularly. As these will both provide more support for your spine and encourage a better posture naturally. Shoulder braces are the most common types of posture brace and will produce the strongest effect. The idea with these is to use the brace to pull your shoulders back rather than allowing them to hunch and round. By doing this you will straighten your neck and spine into alignment, lift your chest up and release tension in your thoracic spine. And a good one to try is the Comfymed Posture Corrector. This one is well made and more comfortable to wear than some of the other shoulder braces on the market. It's also easy to put on and adjust by yourself. And while it does come with a belly strap this is more to hold it in place than to provide any kind of support. These braces work similarly to the shoulder braces (albeit slightly less intensely) but they also come with a brace that wraps around your lower back. And this is helpful in a couple of ways. Firstly it can assist your core muscles by providing extra support for your lower back. So if this sounds like something you'd like to try a good option is the Flexguard Back Brace Posture Corrector. This​ one is affordable, fully adjustable and does a good job of pushing your shoulders back and straightening your spine. It also comes with an exercise and posture guide that will make it easier for you to hold a good posture throughout the day. Posture shirts, vests and tank tops are a more comfortable way of correcting your posture. 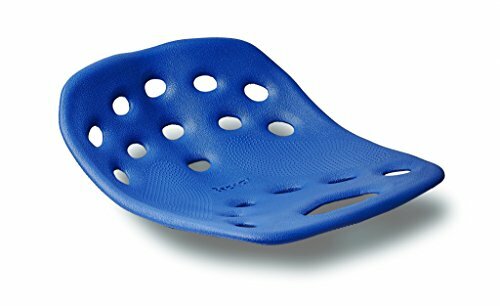 However they may be better for preventing ​bad posture from occurring rather than correcting it though as they are not as strong or intense as the other posture braces. They come in two different varieties. There are ones with a posture brace woven into the material of the shirt and there are others where the shirt contains elastic bands that press on certain muscles to keep you upright. Either of these can be effective but I'd recommend trying the latter option which is what is in the AlignMed Posture Shirt. This​ shirt is used by professional athletes to avoid injury and improve performance but it was actually designed to help the average Joe with their posture. It contains neuroband technology (elastic straps built into the shirt) that work to put your muscles into proper alignment but at the same time keep them active. This helps to keep your postural muscles stimulated throughout the day and helps to retrain them to hold this posture when you are not wearing the shirt. And it also helps to increase your body's awareness of posture so you'll be able to spot when you're slouching easier. So pretty cool results for just wearing a shirt! However because they are tight fitting they can be a bit uncomfortable to wear at first and may not suit everyone. But they can be a great accessory to you whether you are sitting at a desk, playing a round of golf or working hard on a construction site all day. Sitting can be tough on your back, especially if you sit with an unhealthy posture. It's really important to maintain a good posture when you sit as sitting for extended periods has been shown to be a major cause of the development of lower back pain. So work on maintaining a good posture as you sit (like in the photo below) to keep your back healthier. When you sit down the vertebrae in your spine become compressed, which can lead to a weakening of your spinal discs over time. Your core muscles remain inactive and weaken, meaning your back gets less support. And while a good sitting posture won't solve all these problems, it can help to minimise the strain and pressure on your spine and lower back as you sit. And if you find it a struggle don't fret as you can also buy posture correctors that will make this easier to achieve. This is a great new product that really helps to keep you in the right alignment and posture as you sit. It has an ingenious design that uses your knees as anchors to pull you up into a healthy sitting posture effortlessly. Firstly you place the back pad around your lower back. Then you position the knee straps around your knees. This makes it easy to maintain while you sit and over time your muscles will get used to this position and start to adopt it naturally. It's also lightweight and portable so great for taking with you on trips or long journeys. The BackJoy SitSmart Posture Plus is a seat that you can place on any chair to help you to sit with a healthy posture. It works by tilting your pelvis into a naturally healthy position as you sit on it. But while this seat will encourage you into a good sitting posture you will still need to use your core muscles to keep you upright. And this is a bonus because it prevents those muscles from weakening (which is a big problem when sitting) which allows your back to stay better supported. Placing a lumbar support cushion between your lower back and the back of the chair you are sitting on is a great way of maintaining a good sitting posture. This is because by not allowing your back to flatten against the chair it encourages you to maintain a healthy 'S' curve in your spine as you sit. They work so well that they are commonly recommended by chiropractors and physicians. And they have been shown in stu﻿dies to help people with lower back pain to sit more comfortably and with a healthier spinal curve. 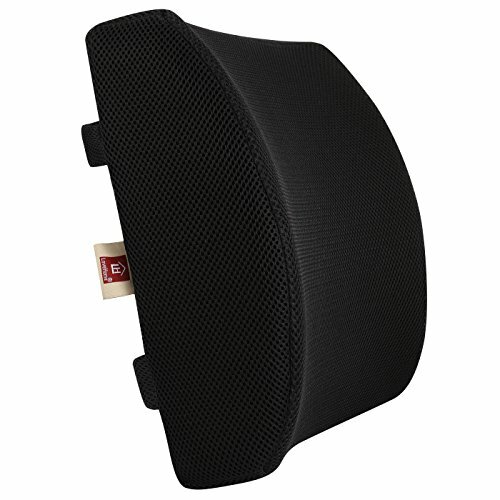 And the one I'd recommend is the LoveHome Memory Foam Lumbar Support Cushion. The memory foam is super comfortable and it provides enough support to stop your back from flattening out. It's also breathable with a mesh cover that means you won't get hot and sweaty while using it. And it comes with an adjustable strap to hold it in the right position as you sit. Each posture aid I've covered here works to encourage your body into a good posture that will keep you out of pain. However the end goal with each one is to retrain your muscles and body over time to the point where being in this healthy posture is natural and easy. ​And why not use technology to help us to do this as well? 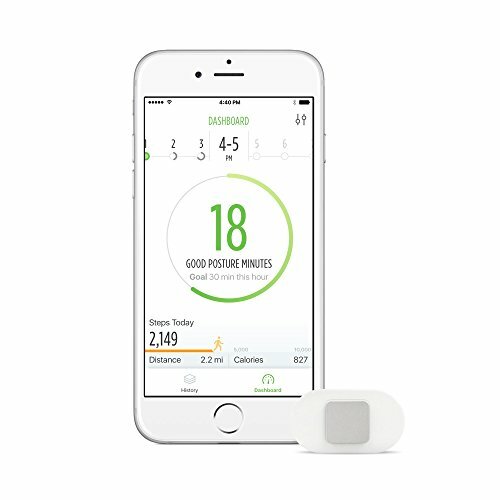 Because there are now some great devices that will track your posture and movements throughout the day and report back on any mistakes you are making. Which is a great thing as it can be so hard to stay aware of your posture all the time. These devices use magnetic sensors that give off a small vibration if they detect you have fallen into a bad posture. Which helps to keep you on track and maintain a good posture throughout each day. But do posture correcting smart devices actually work? There are a few of these devices around such as the Upright Pro﻿﻿﻿ Posture Trainer and they all work well but my favourite one is the Lumo Lift Posture Coach. This one will give you everything you need to retrain your body into a better posture. ​The Lumo Lift is a small magnetic sensor that you clip onto the front of your clothing in your upper body area. It's so small that this can be done really discreetly meaning you can wear it to work or when out in the public without any embarrassment. This magnetic sensor will detect forward, backwards and sideways movements so that it can tell when you have slipped into an unhealthy posture. And when this happens it will start to vibrate gently which will alert you to the problem and allow you to sit or stand up straight again. You connect it up via bluetooth with the Lumo Lift app which you download to your smartphone. And you can adjust the program so that the vibrations only go off after you've been holding a poor posture for a certain amount of time. Which is good as it allows you to shorten the time as your posture gets naturally better and better. So all in all I think this is a great idea for someone who wants to learn how to carry themselves in a more healthy way and reduce their back pain. So you'll be up(right!) and running in no time. Adopting and maintaining a healthy posture is not the easiest thing to do if you've spent years with a bad posture. As it can be difficult to retrain your body and break old habits. So why not give yourself a helping hand with a posture brace or corrector? By using one or more of the suggestions I've given you in this article you can make getting used to a new and healthier posture a hell of a lot easier. So make a start on improving your posture today​. And you'll be well on the way to a better posture and less back pain in no time.